Flannel button-up shirts are wardrobe workhorses because they can be worn as shirts, second layers or tied around the waist. Talk about a triple threat top! 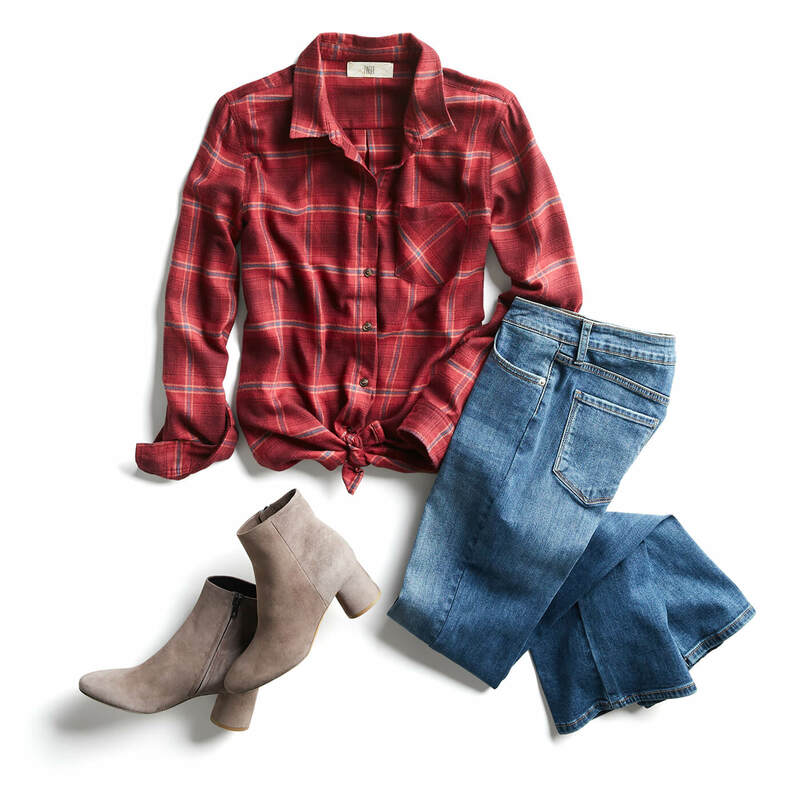 Whether you’re new to the flannel fan club or a flannel-ista, we’ve got ironplaid outfit suggestions to keep you buttoned-up 365. Keep scrolling for flannel outfit inspiration! Give modern 90’s grunge vibes when you pair a flannel with distressed denim. Wear your flannel buttoned-up or open over a graphic tee, then layer on a classic moto jacket. For an edgy encore, finish the look with lace-up boots and a studded crossbody bag. Tuck the bottom of a colorful flannel button-up into a feminine a-line tulle skirt for a romantic rendezvous. If you’re not a fan of tucking in your top, unbutton the last 3-5 buttons of your flannel and double knot at the waist. Give your flannel some frost and slip a sparkly statement necklace under your collar. Complete the look with pointed-toe pumps, and add a fitted blazer if you need another layer. Stylist Tip: Blessed in the chest? Don’t stress! 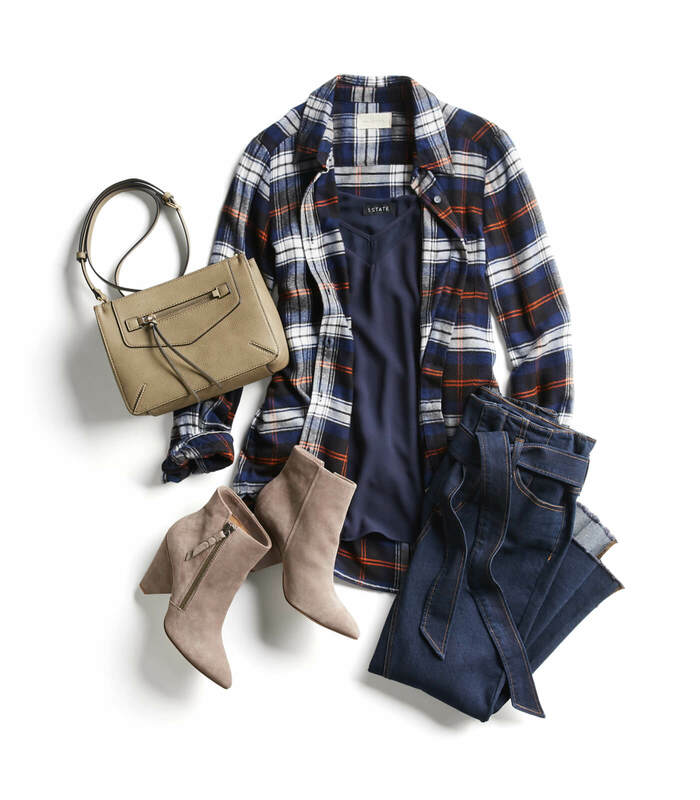 Opt for an oversized flannel with stretch to accommodate your curves. Our favorite way to wear flannel? With a simple pair of jeans and ankle booties of course! If you’re looking for a casual Friday work outfit, simply layer a black blazer over your flannel, or if it’s the weekend (finally!) trade your jeans and booties for leggings and sneakers. Stylist Tip: While we might frequently associate flannel with a heavyweight fabric, they are actually made in a variety of weights. Since flannel is brushed cotton that gives the appearance of wool, it’s naturally breathable. Looking to add more flannel to your closet? Let your Stylist know when you schedule your Fix!